As you know, we spent time at Disney earlier this week. Since we've come home, there hasn't been a whole lot of training. Okay, I don't think either of us did anything but go for a walk...haha. But all that will be changing this week. I am determined to stick to a strength training and stretching schedule for the next couple of months. I am not as sore after finishing Glass slipper challenge as I was when I finished the Goofy Challenge, so this gives me hope that I may be on my way to healing and that I just might be "okay" for Tinkerbell in May! Before we left for Disney, we said we wanted to do some new things that we have never done before during our visit. As we find our favorite things to do or eat at Disney, it does get harder to try other things. We thought we would share some of our favorites and "new" things we've done. We had a spectacular view from the Fiji building at the Polynesian Resort. So far, trying something new isn't not going very well. 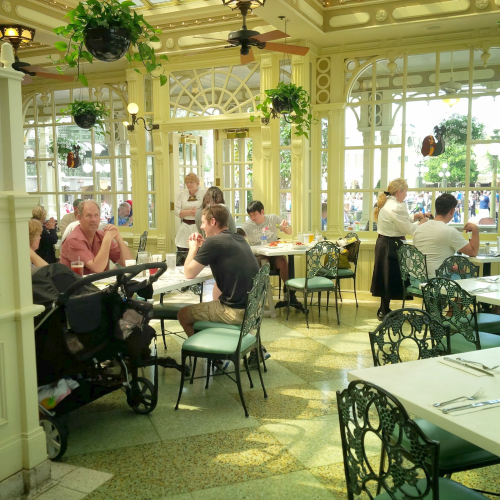 Tony's Town Square is one of our favorite restaurants in Magic Kingdom. It is known as the Lady and the Tramp restaurant. Cape May Buffet Character Breakfast: ( We have been to this restaurant a few times for dinner but never for the character breakfast). Tony's Town Square: Visited Before. We totally failed on trying new restaurants. Attractions outside the theme parks. Typhoon Lagoon is one of two water parks at Disney. 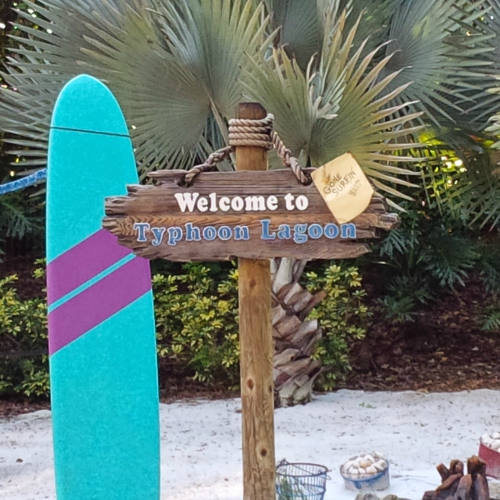 Typhoon Lagoon: Visited before MANY years ago but doing it again this past week was like doing it for the first time. It was SO much fun. We relaxed in the lazy river but then did all the tubing water slides. 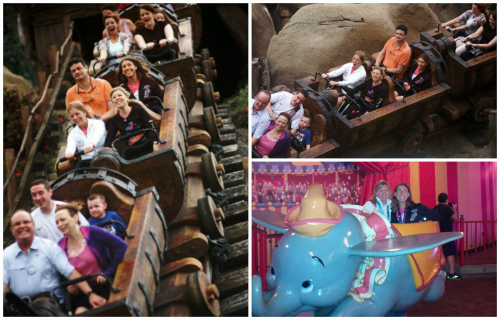 Dumbo: We FINALLY rode Dumbo! 7 Dwarves Mine Train: We finally got to ride this too. We always pass it by because the line is SO long ( we always miss getting a fast pass). This was the first ride we went to when the park opened and we only waited about 40 minutes ( maybe less). I think trying 2 new rides was a success! We've met many of our favorite characters ( but in different costumes) but I won't count them. 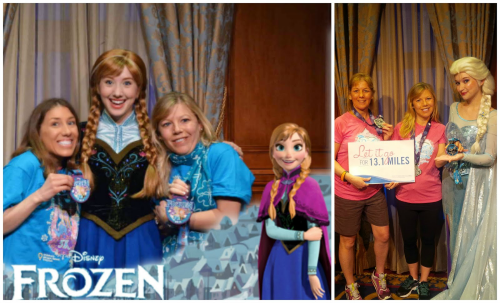 The NEW characters that we've met that we've never met before were Ana and Elsa ( and believe me if the theme of the race hadn't been "FROZEN", we wouldn't have waited in line to see them. We are not that serious about meeting characters....haha. 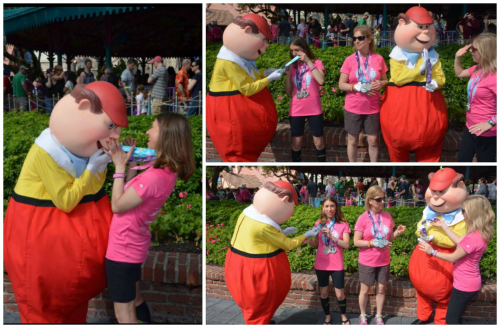 We also met the Tweedles this visit, and a few new characters along the race course. So in all, we totally failed at eating at new restaurants and trying new attractions but meeting new characters and riding new rides counts as a success. I think we will make more of an effort to do new things during our next trip ( I know we say that each time..lol). Chocolate chip cookies sound wonderful! It can be tough to try new things when you already know what you enjoy! It still sounds like a great trip and I'm glad to hear you've been recovering well! Yea, we always go for the stuff we already know we will enjoy! HAHAHA! Love the guy in the orange shirt! You have to wonder if he's trying to be cool, or if he got dragged along by his girlfriend and just wants to go home. I tend to not do new things much either. Although DL is much smaller than WDW, so after a while it's hard to find new things. There are a few rides I've still never been on. It appears that orange shirt guy is a single rider, seeing that he is sitting with my sister...lol. I suppose it was HIS idea to go on the ride, you would think he would try to have some fun...haha. LOL...you could make up a whole story. The guy has a fear of roller coasters, so his therapist is making him work his way up to scary ones. Maybe he's secretly a Disney shopper, on the ride to see how the people around him react. OMG, all I see when I look at that pic is Orange shirt guy now...too funny! I had the same reaction as Jennifer K to the guy on the roller coaster, ha ha! Love all the pics. Looks like it was an awesome trip overall. When I ran WDW half 4 years ago, we stayed at the Polynesian. I had stayed there as a little girl and it was just as I remembered it! We loved it. What we didn't love so much was the food. 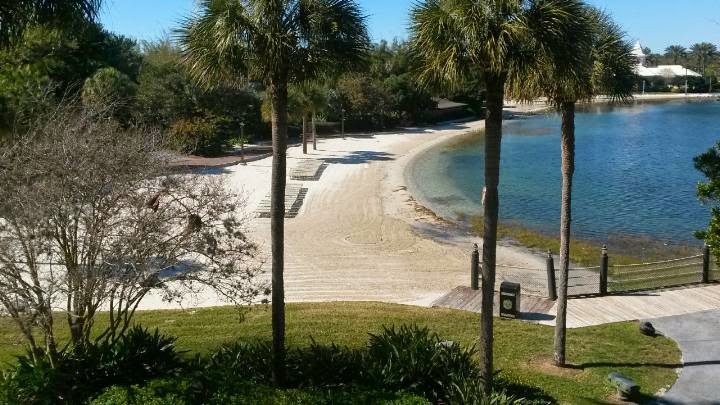 We ate lunch at the resort and had a mediocre overpriced meal. So disappointing. I even filled out a survey, but never heard from Disney. We ended up driving to Kissimmee to eat many of our meals. We never worry about doing new things but we did got to Downtown Disney and the last time Christine had been was as a child. Typhoon Lagoon used to be a favorite place to go on our trips, but we have not visited one of the water parks for years. Glad you had a great vacation, but sorry I never saw you girls. Sounds like an amazing trip, and so cool that you got to try 2 new rides. You two are funny! It is hard to try new things when you know the old things are so awesome! I'm glad you had fun! I tried a new race this weekend, the Best Damn Race, I recommend it! SO SO SO SO FUN!! Im surprising my girl with a trip this summer. Sounds like a blast. I haven't been to Disney in almost 20 years!! Sounds like you had a blast though! Strength training and stretching are on my list today too! The 7 Dwarfs Mine Train was a little disappointing. It's such a short ride. I think we waited about an hour too. But, it was new so we HAD to try it. 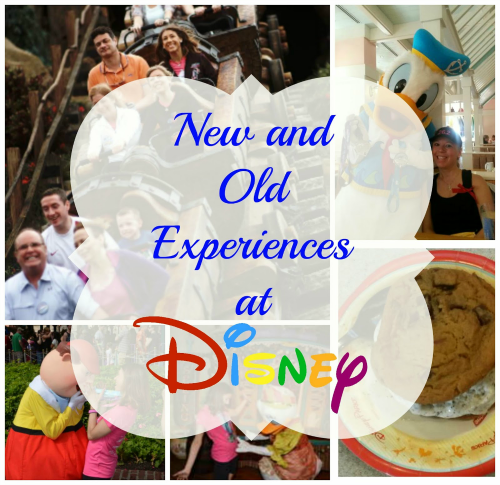 Any trip to Disney is a WIN whether you stick to old or new! It's so hard when you know what you like! it is so hard to do new things when there are some many great things to do! Im glad you gals got to do 7 dwarfs mine train and see anna and elsa! I did a few different things this time including doing breakfast at 1900 park fare and lunch at crystal palace. I still need to try tony's!